May 2001, and I had a new bike to christen. 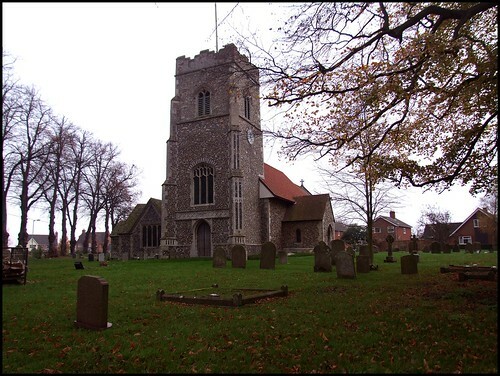 St Peter, Henley, was the only church left in the Ipswich area that I'd never visited, and so I headed out to it. Ipswich's Henley Road, in little more than a mile, cuts through the town's poshest neighbourhood, and then skirts one of its poorest. Soon, though, I was riding the hilly road up through the vanished settlements of Thurleston and Akenham, exploring all 24 gears, and generally having a whale of a time. Reaching Henley shortly after, I found St Peter hemmed in by its tight graveyard surrounded by houses - a proper village church, when so many around here are isolated down narrow lanes. St Peter looks Victorianised - but there is rather more to it than that, as we shall see. In any case, the Victorians are too often criticised for their work in places like this. If it had not been for their restoration, it is likely that St Peter would be a ruin by now. I came back here in late 2007; as you would expect, not much has changed. This is broadly a14th century creation, with evidence of a Norman past, but there is an unusual window in the south nave. It is made of terracotta, and dates from the 16th century. You can see the same thing nearby at Barham and Barking. It probably came from the original Shrublands Hall, demolished in the 19th century to be rebuilt as a Victorian extravaganza. There's a fine fellow glaring out of the flintwork beside it. 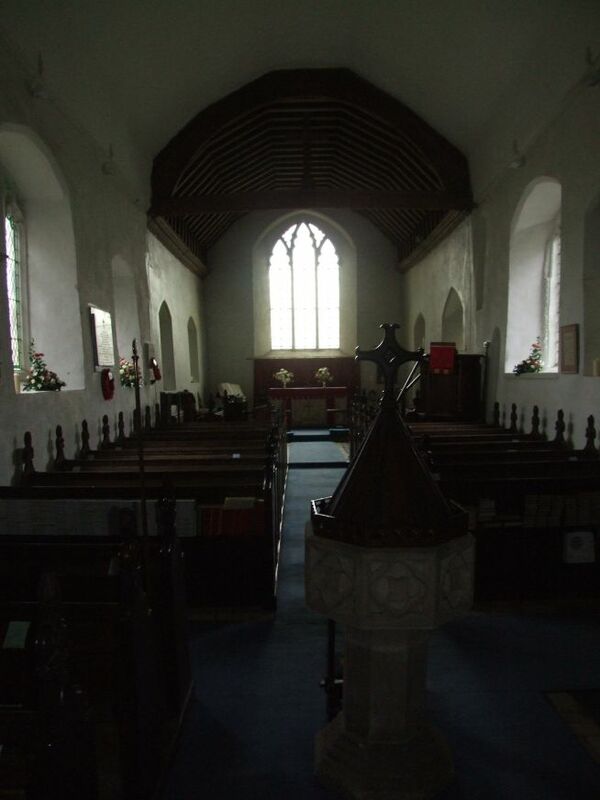 He probably came from this church, possibly from high on the tower before its restoration. St Peter is blessed with churchwardens determined to keep it open, taking seriously their responsibility to be a living act of witness. They are to be congratulated.You step into the porch, past an unusual stone board of rectors of the parish. These boards, to be found in most churches, but usually made of wood, were a Victorian conceit, to try and overcome the rifts of the Reformation and Commonwealth. To see that long succession back into the 13th century, you might think that the Church of England had always been here, and had always been like this. Prominent among the names on it are the father and son Henry and William Pearson. Dynasties of Rectors are fairly common, but what makes this pair remarkable is that they had care of the parish for a little short of a hundred years between them. They entirely oversaw the Anglican revival in this place. Indeed, they were probably responsible for this board itself. It seems incredible to think that Henry took charge when the first waves of the Oxford Movement were beginning to rock the CofE boat; when he became Rector here, Newman had only just renounced Anglicanism. His son, on the other hand, was Rector during the two world wars; in fact, he died in a fall during the blackout. 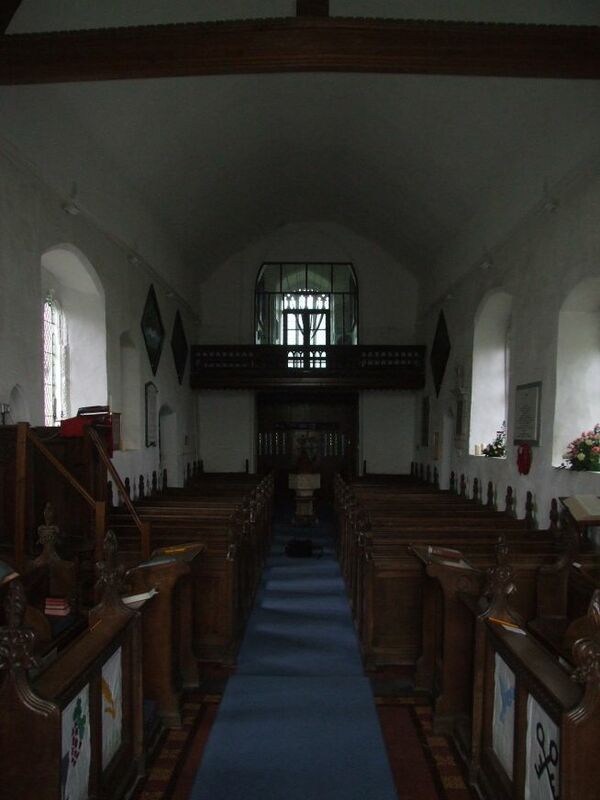 They must have baptised, married and buried generations of villagers between them, while at the same time turning their church from a preaching house into a sacramental Gate of Heaven. They are buried in the churchyard. It is like a novel. You step into their legacy, a neat, pleasant Victorianised church, entirely Anglican, thoroughly welcoming. There is not much to show inside for the medieval life and liturgy of this place, perhaps, but both piscina and aumbry in the sanctuary are fascinating. The aumbry retains the fittings for a door frame. The piscina contains a most unusual thing, which cannot be in its original place. It is possibly a former holy water stoup, but Mortlock was convinced it was a rare and uusual pillar piscina. beside it, the drop windowsill once contained sedilia. There are three grand hatchments at the west end, where the enclosure of the ringers' room beyond the gallery is most effective. There are some fine modern carved bench ends, including a beautiful one of barleycorns. The war memorial is heart-breaking, listing as it does those boys who were formerly singers in the choir. Isaid that Henley's pretty church had few remains of its Catholic past. This isn't strictly true, however, for if we go back outside, and around to the west door, we see the dedicatory inscription of Thomas Seckford, asking for our prayers for the souls of him and his wife. A similar inscription survives at Great Bealings, where he is buried. Intriguingly, the spandrels of the doorway below carry the symbols of both St Peter and St Paul, suggesting perhaps that the medieval dedication of this church was to the feast of both of them, and not just to the first.